So when someone asks "Where's Lynda" you can tell them she's having therapy. That would mean I'm out in my garden. Truly I'm feeling so good that i stopped taking anti-depressants before Christmas and managed to get through the crazy season. Way to go for sharing Lynda. Just tell the world you are a loony. Well I'm not, I'm just extremely emotional and FEEL everything, even when its a fictional character or (hello!) a TV commercial. Some people have a little sniffle, I'm totally wrecked. 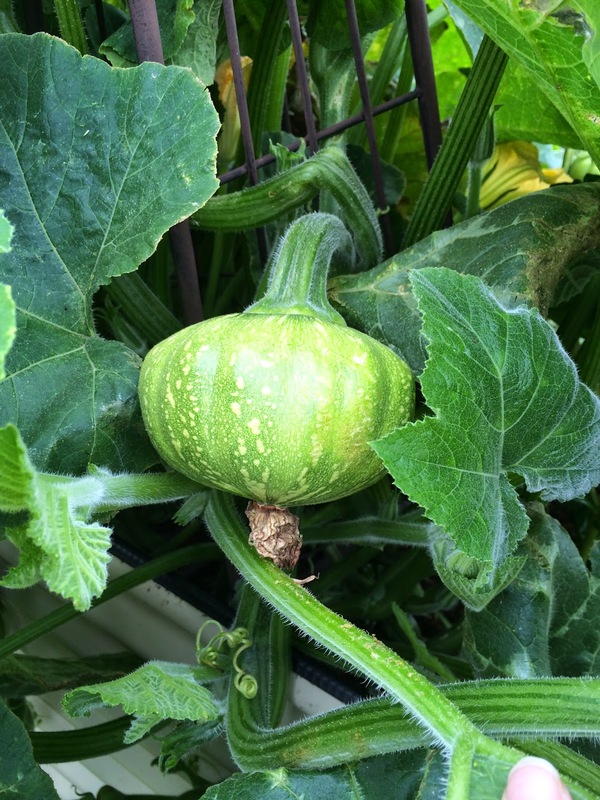 So, the news is that I'm doing more than OK and much of that has to do with my garden, my family, friends and the motley crew of bloggers that i check in with each day. Thank you to all! 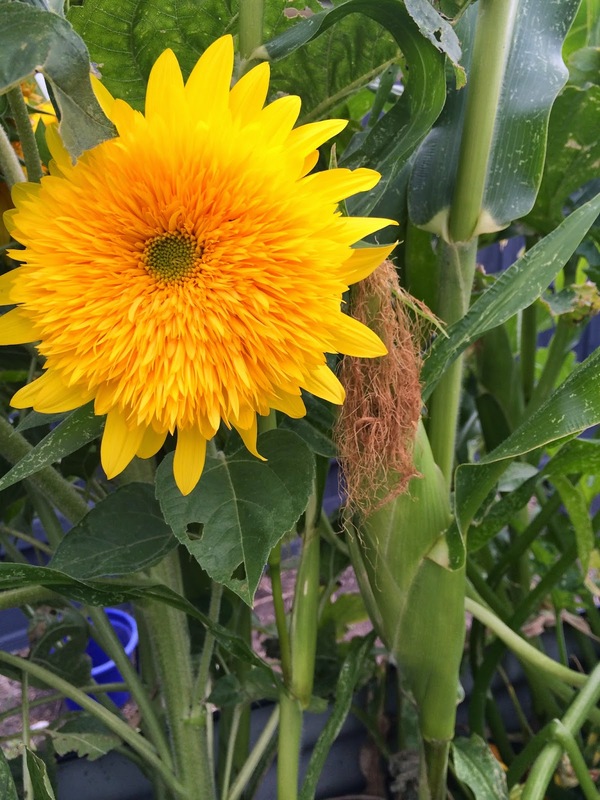 The yellows of the sunflowers and zucchini blooms are waving their magic over me. 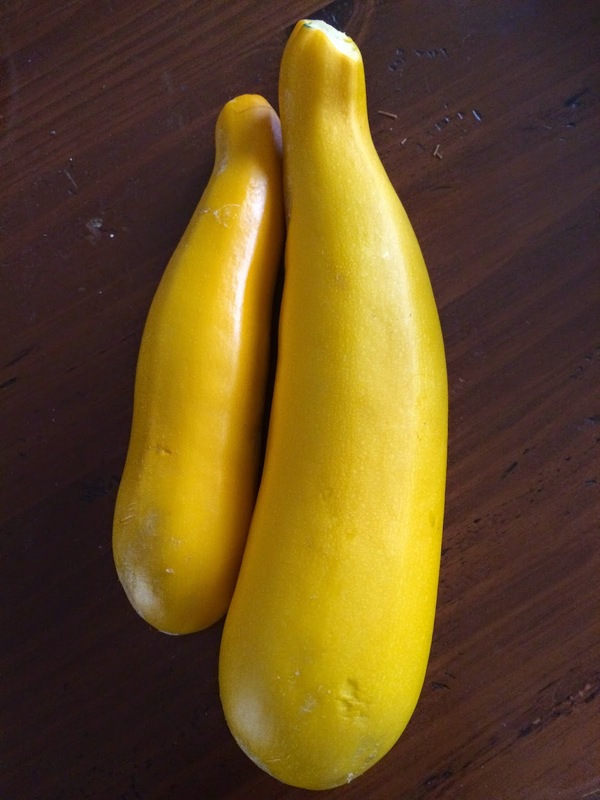 The dark green knobbly cucumbers and the weird shaped Tromboncino are in-sighting me to laughter. Its all so beautiful and abundant. I cant see any major bad bugs anywhere. I've not sprayed a thing. Just companion planting, plenty of water, lots of poop when necessary and laying down the grass clippings when the soil is exposed. The soil has a soft moist doona on top of it. The only fly in my ointment is the occasional half eaten cherry tomato or strawberry from visiting birds which is nothing when i read in other blogs of the vast array of creatures invading gardens elsewhere. 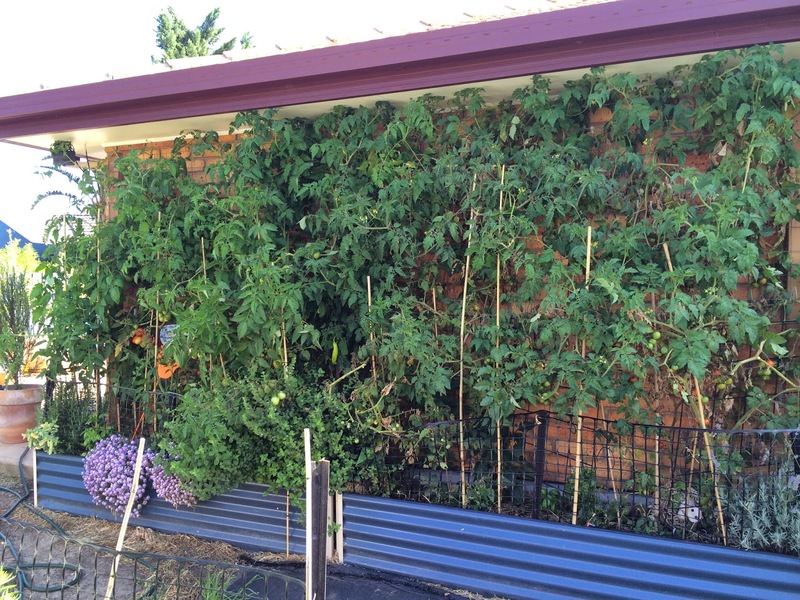 My wall of tomatoes are providing me with an abundance of produce and our meals are based around them. Oh my goodness, lets just pause and take a moment shall we. 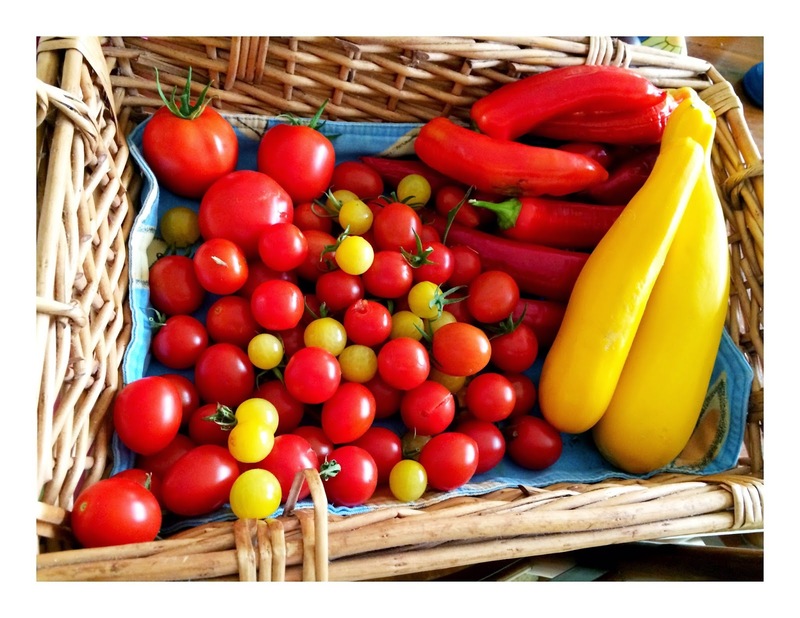 When you look at this basket of today's morning pickings, then you know that lunch is going to look a lot like this. It looks like its swimming cheese but it was just a sprinkle, honest. So yum... When i was making the tomato base i looked and found that i didn't have any Italian Herbs. DOH! Hello! its growing outside duffa! So when husband brings home even more tomatoes from work (I'm not the only one having a good crop) then i feel a pasta sauce coming on. Six hours later, the smell is right through the house. 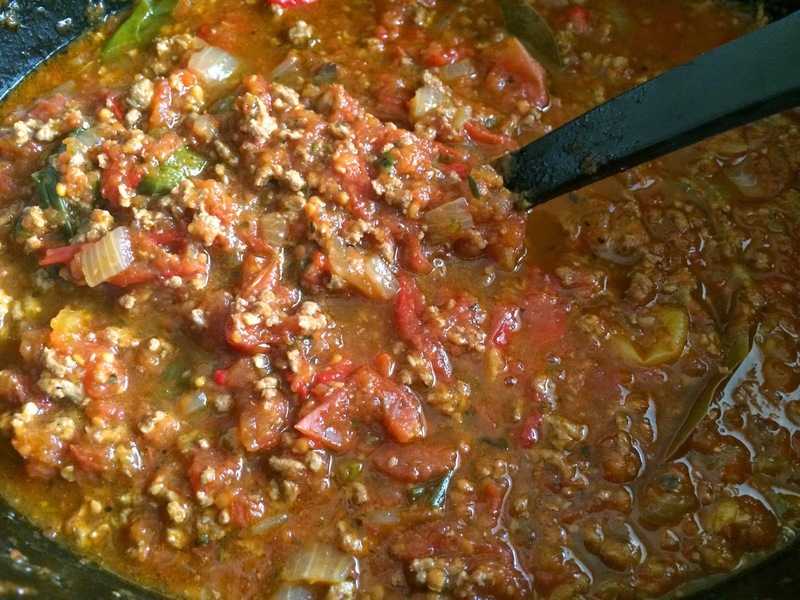 My latest thing is adding a few slices of salami to the sauce while its cooking. It really enhances the flavour. I dont remove skins, in they go chopped. I was missing carrots but im sure it will taste as good as it smells. My tomato futures. You didn't think I'd put all my eggs in one basket did you. 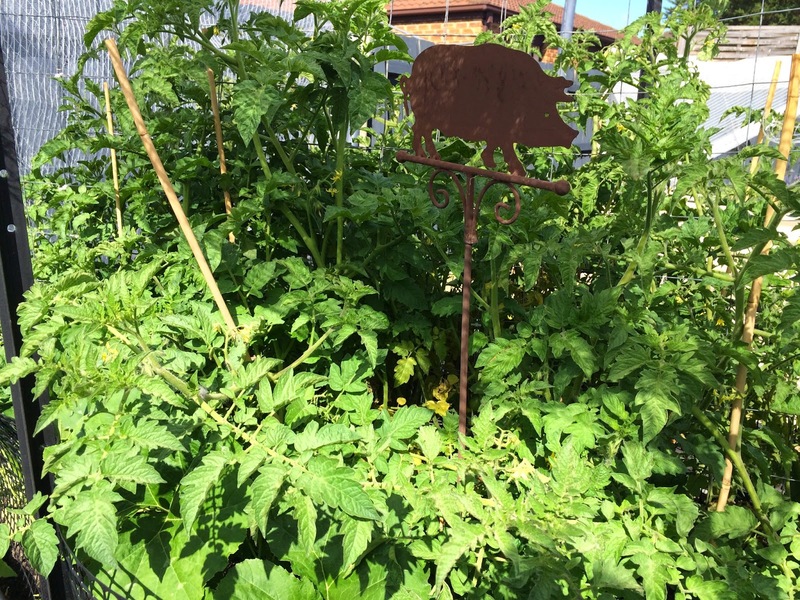 In fact there are tomatoes in every one of the eight beds because they are coming up all over the yard. This crop is about a month behind the other one and has been protected from the heat. They are mostly heritage varieties. I've opened it up now to get some sun and i will have to trim back a few stems to open it up to air. That's lovely job for cool evenings. The lettuce bed is now providing me with a daily salad. I need to stagger the crops better as I've had a month of no fresh lettuce. Shopping in your back yard is real convenient when you are making lunches at 5.30am. You can just see one of the poles that are painted and ready to go in for my espaliered fence garden. 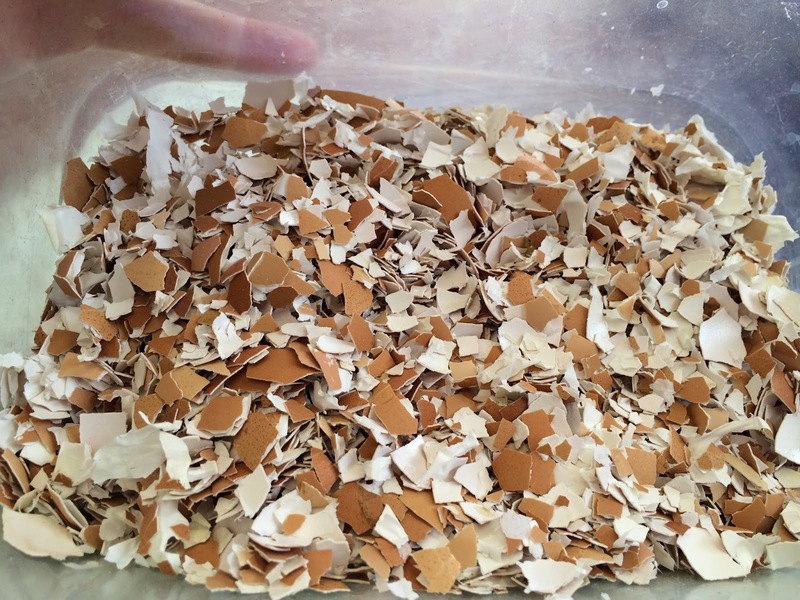 Egg Shells - more therapy. I save all the eggs shells for the week. They are washed as used and then dried on the window sill in the kitchen. (Great decor). On a weekend morning, i take them out with a cup of coffee into the pergola and while enjoying the view i break them up by hand. Its very therapeutic. Try it. There is that initial ouch factor and then over time they break up until its quite grainy like sand. This is about half way. I add it to my soil, worm farm or on top of soil around the lettuce to stop slugs and snails. Tom's vertical pumpkin frame is working well. I cant wait till its covered. 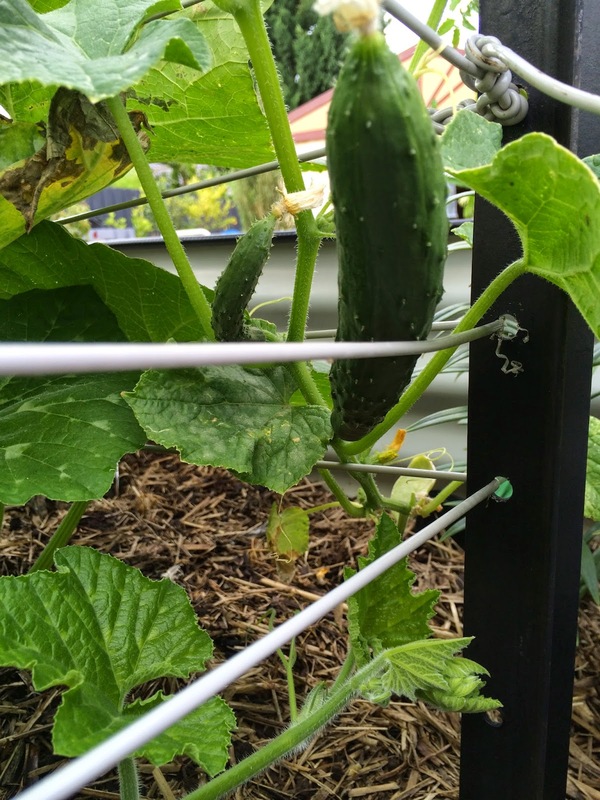 The cucumbers are in there as well. Not everything is perfect. 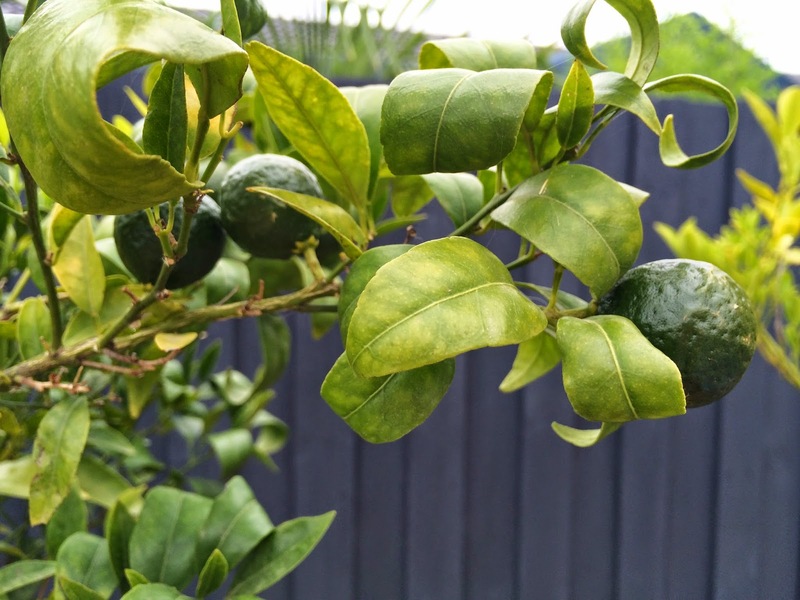 I have leaf curl on my mandarin tree. Dr Google tells me that since its also yellowing i might have a potassium deficiency and i also need to keep the water up. I'm not seeing any little bugs but a dose of while oil wont hurt. I had one mandarin last year and now i have about a dozen on my small potted tree. OK, i think I've bored you all with the garden overview but really, not much is happening at the moment, which i guess is a blessed relief. While I've been playing here the sauce has finished and I've made tonight's dinner. 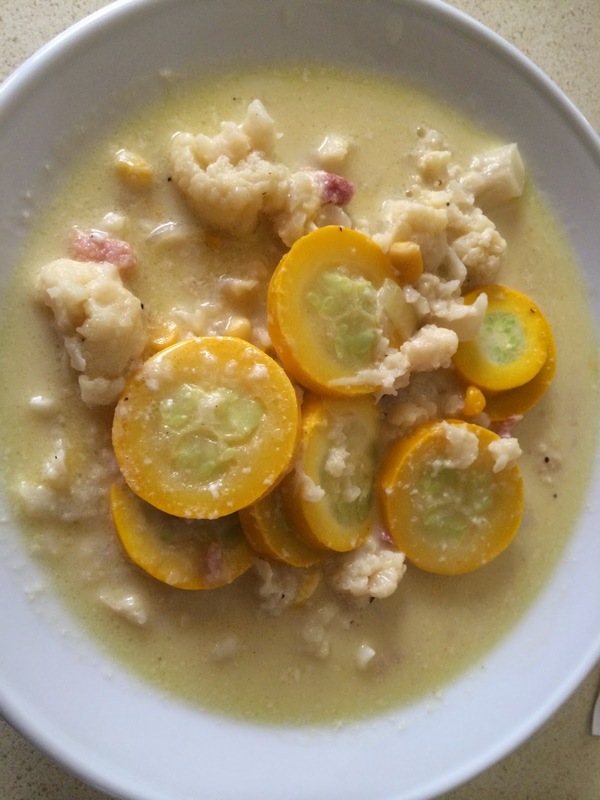 Creamy cauliflower, bacon & corn chowder - with the late addition of yellow zucchini. It was yummy. Today's menu was brought to you by the following inspiration. Thanks Kathy, one of the many that brighten my day. Your garden and veg are looking great, that chowder made my mouth water. There was certainly nothing left in the pot. 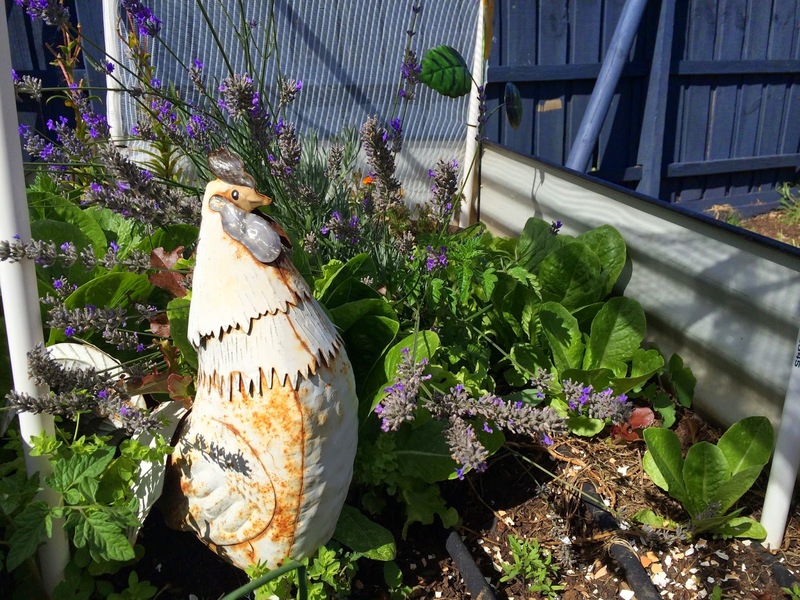 awww your garden is looking beautiful & yes it is great therapy too! 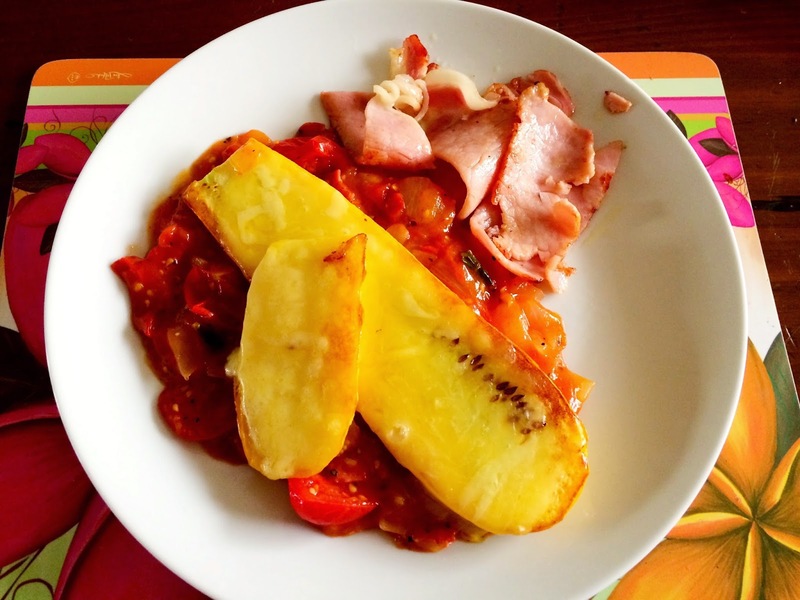 your meals all look delicious! Rhonda's was the first blog i followed. I asked her advice on setting up my garden. Wow just look how tall those tomato plants are, you have such a green thumb. I like Toms invention I may have to steal that idea tell him as I quite like it. 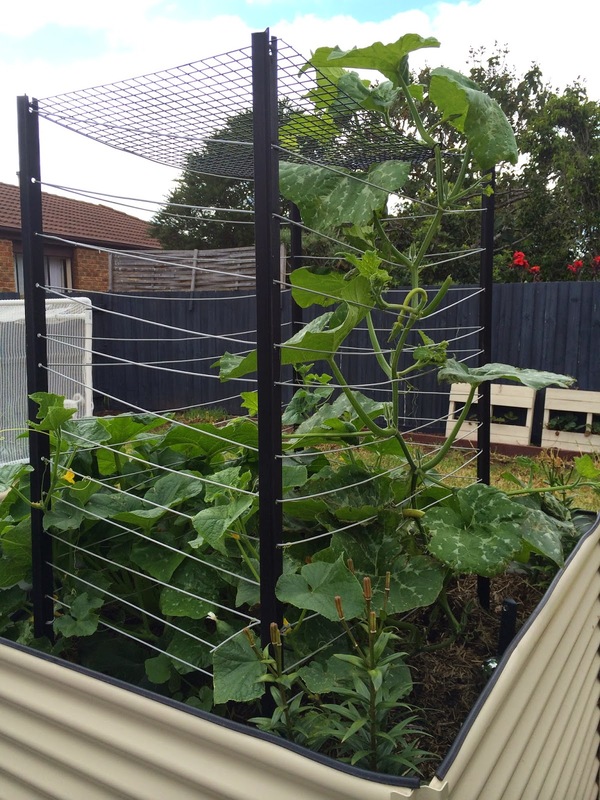 Ive been a lazy vege gardener this year no tomatoes are staked and I think I have had 2 red ones so far lol. Tom has just told me he would be happy to build you one. Just 4 tall pickets that are same height (so holes line up) and a roll of clothes line. Hey any excuse for a visit and too get him out of the house. Your garden is looking spectacular Lynda, especially those tomato plants, they put mine to shame. Tomatoes are the one plant that I struggle to grow. I think it may be heat related though as while the weather has been cool they are doing really well. I hope Summer continues on this way, but I know that it wont. Gardening is good therapy when feeling down, my veggies garden is my little refuge when things are getting to me. I have a bench out there so I can just sit and ponder for a while. I think its perfect tommy weather down here at the moment. Must be, they are popping up naturally and mother nature knows best. Therapy, I love that! It is so, so true. Nothing grounds and focuses a person like working in the garden. Your wall of tomatoes is truly inspirational! Can't wait to get back to it here, in the terribly chilly north. Wow you are on fire Lynda! Glad to hear you're feeling so good - go girl. 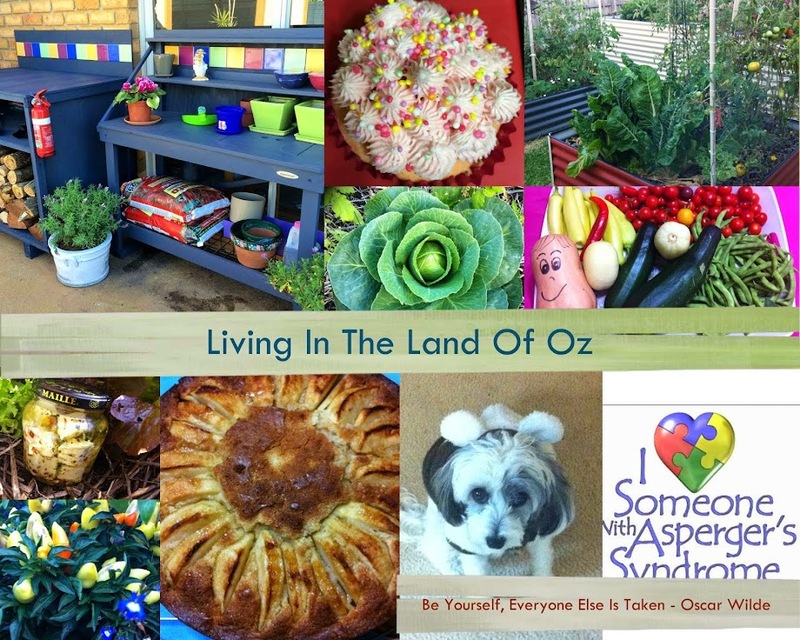 Congratulations also on winning the book from Life at Arbordale Farm blog. Ugh, bad week this week. I think i need to go do some weeding therapy. Can i give them back now?